Mantua’s 40-foot wood-side refrigerator car model appears late in the company’s second generation (1978-2001) line. The model’s tooling closely matches the revised example of this ice-hatch reefer car that first saw inclusion in TYCO’s line. This revised tooling of the original model included solid or filled-in stirrup steps. The only separate detail on the plastic shell was a brake wheel. This series of Mantua 40-foot wood-side reefers included die-cast underframes. Going by catalog appearances, you’ll find this model debuted in Mantua’s 1993 annual product catalog. There was another 40-foot refrigerator car in Mantua’s line. That model is also an ice-hatch style reefer, but it features a rivet-side steel body and came from the Lindberg toolings. Mantua introduced this steel reefer, along with the other former Lindberg freight cars in the early 1980s. Collectors should additionally be aware of the original Mantua-TYCO 40-foot steel reefer car model that differed from the Lindberg version. The Mantua-TYCO steel reefer is not known to have seen inclusion in the second generation collection of Mantua offerings. Present on this page are known examples of the 40-foot wood-side refrigerator car model. Information is largely from Mantua’s annual product catalogs. This information is always subject to confirmation of actual production model examples, as stock numbers and catalog images did differ from at times from what was the regular run offering. The 1989 catalog shows this model as new and lists five selections (A&P, Baby Ruth, Gerbers, Kraft, and Peter Peebolt) as ready-to-run releases carrying a $7.50 suggested retail price. The 836-series number of this model only appears in the 1989 catalog. Mantua lists its 40-foot wood-side reefer with 739-series numbering after the 1989 appearance. 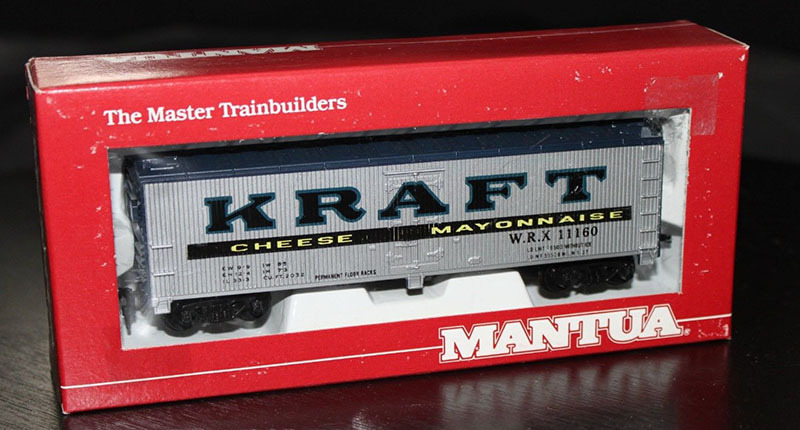 Mantua’s 40-foot wood-side refrigerator car model made appearances through the 2000 catalog and is absent in the company’s 2001 final year of independent production prior to becoming part of the Model Power/Model Rectifier Corporation line. A good way to determine these second generation Mantua 40-foot wood-side refrigerator car models for those issued by TYCO is the inclusion of a die-cast metal underframe and white “Made in China” origin sticker included on the Mantua releases displayed on this page. This view shows the underside of the Union Refrigerator Transit offering with die-cast floor.